For Brad, the holidays have always provoked a sense of wonder, love and inspiration. 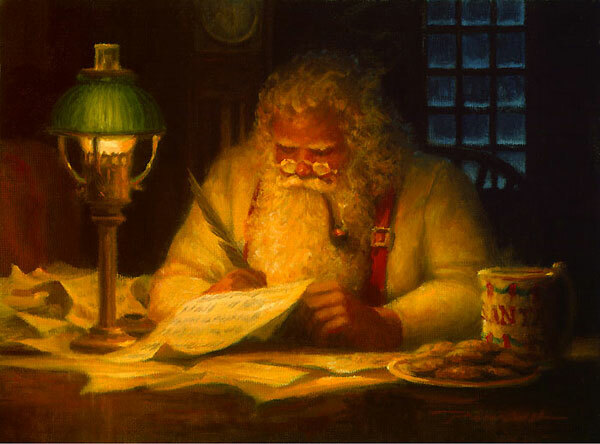 In this gallery of Holiday Art, he takes us on a journey back to that time of wonderment we felt as children. As a single parent, his mother supported Brad and his sister on a secretary's income. When Christmas came around, they exchanged handmade gifts made with great love because they did not have enough to purchase presents. As a child, Brad was no different from other children, often wishing for that special new toy, even though he knew it could not be. He would hope and pray that the pipes in the trailer would not freeze and that they would have enough money for food and heat on cold winter days. He would fall asleep many nights imagining what it would be like for family to have no worries at Christmas and dream of a Christmas with no fear or uncertainty. Brad carried these memories with him into adulthood, which profoundly impacted his Christmases yet to come. After Brad married and had his own children, he continued the tradition of handcrafted gifts from the heart, because this had become the true meaning of Christmas for him and something he felt was an indispensable tradition to instill in his children. His memories would elicit the innocence, hope and excitement of his youth, especially at Christmas, and inspired some remarkable holiday pieces. The pieces on this page represent some of Brad's artwork inspired by his childhood memories recalled as a father. In the piece entitled "Shh! 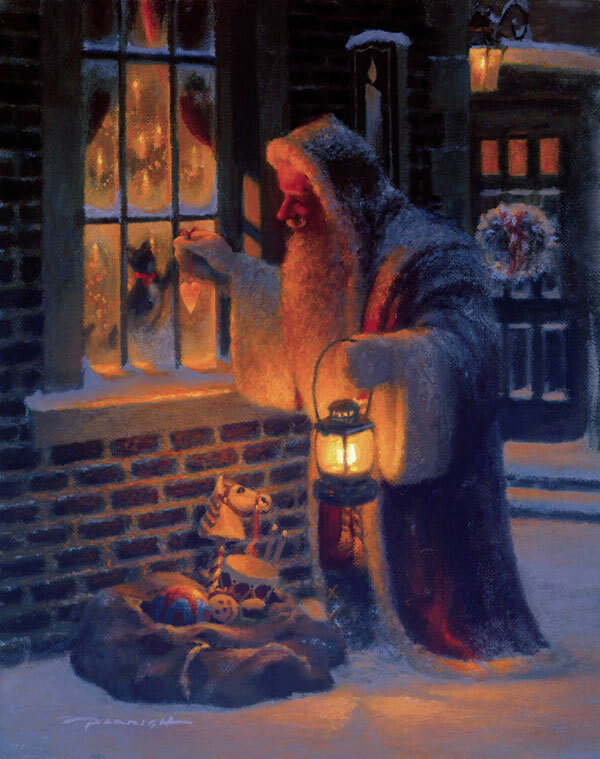 ", Brads envisioned his eldest son Andrew anticipating the arrival of Santa, peeking out the upstairs window. "Mouse King" was composed upon expecting his first baby Andrew while listening to the music of Tychowski's masterpiece The Nutcracker and or his daughter Haley, he created the "Sugar Plum Fairy" pastel. The "Nutcracker" paintings were made in celebration of his son Adam. Shortly after I completed this special painting in 1992, I had already made up my mind that I was going to retain it as the first piece of my personal collection and I would keep it for twenty-five years. I would take the opportunity to own and enjoy one of my original paintings, since all of my completed paintings to date had all been sold. Each painting I complete holds memories that are treasured in so many different ways, each for its specific collage of cherished personal recollections that went in to compose the work. I also associated it with the Christmas holiday, so I would wait until this time in the year to make it available for sale on the twenty-fifth of December. Many collectors over the years have repeatedly requested to purchase it, and I just could not part with this piece of me that spawned the very successful fine art Holiday Collection produced by my company. MOUSEKING premiered and unveiled the collection at the National Stationery Show in New York in 2004 before such top national retailers as Neiman Marcus, Saks 5th Avenue, Papyrus and Gumps, just to name a few. This collection was an immediate overnight success and MOUSEKING was well on its way to becoming a notable national brand name. I remember everything about creating this piece as if it were yesterday. It was in October of 1992. I remember that my first born child was only a month away from coming into the world. In the spirit of anticipation of all that was soon to come, I decided to revel in the symphonic beauty and grandeur of Tchaikovsky's "Nutcracker" late one night. While absorbing the music as it flowed through my mind, the vision for this piece surged into my head with such clarity and vivid intensity that I rushed downstairs and grabbed a canvas, brought it up into my studio and immediately began painting. With only my passion guiding me, I created this work to reflect my love and appreciation for this timeless classic composition and was further driven and inspired by the blessing God was about to bestow upon my wife and me, the birth of my first born child who we would name Andrew. I have always been inspired and motivated to create when I listened to music. The magical allure of this art form called music is its ability to draw out our emotions, capture our hearts, souls, and minds, and it entices us to experience a full range of perceptions within one musical score. In only a few short notes, we may be filled with such joy and happiness or become melancholy and saddened by the sounds that we associate and connect with our memories to our poignant heartfelt sentiments. So inspired was I by the beautiful melodies of Tchaikovsky’s immortal masterpiece called “The Nutcracker” and by the upcoming birth of my first child that I put brush and oil direct to the canvas and began painting my vision of what this music meant to me as it connected to my perception of who I saw as this Mouse King was in my mind and heart. All the necessary and special elements came together while creating this piece, which combined for the perfect storm in my imagination. For me, this is one of my greatest triumphs after pulling inspiration from all the beautiful music and all that it meant to me expecting my first child who was to be born during my favorite time of the year. *For Additional Information on This Painting or to Purchase it Proceed Here. 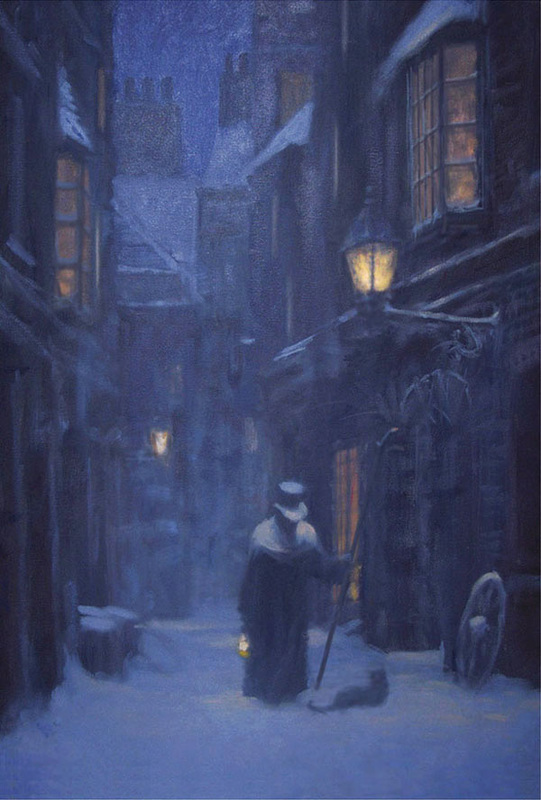 *This original was reproduced as a signed & numbered limited edition print. Photo of the painting as it was being started. Hand Carved Wood/Brass & Velvet Sculpture. 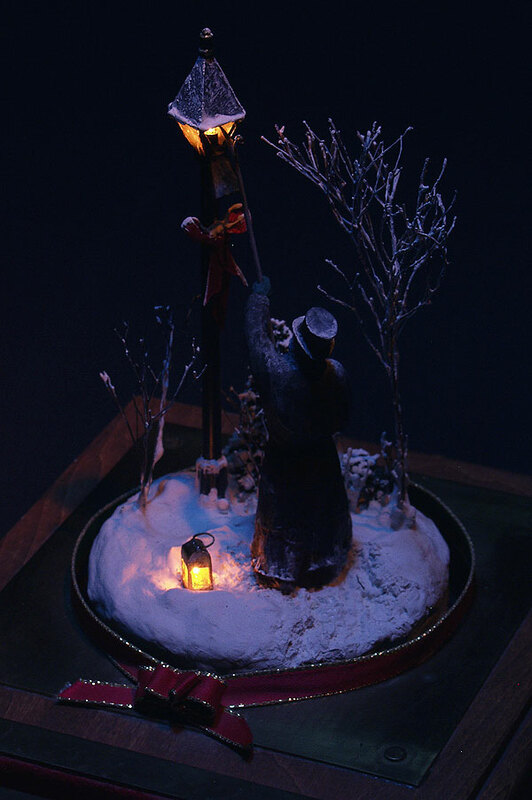 Measures 7"W x 9"D x 10"H.
When the lamplighter book is removed from sculpture to read, the lamplighter under the glass dome begins to rotate. 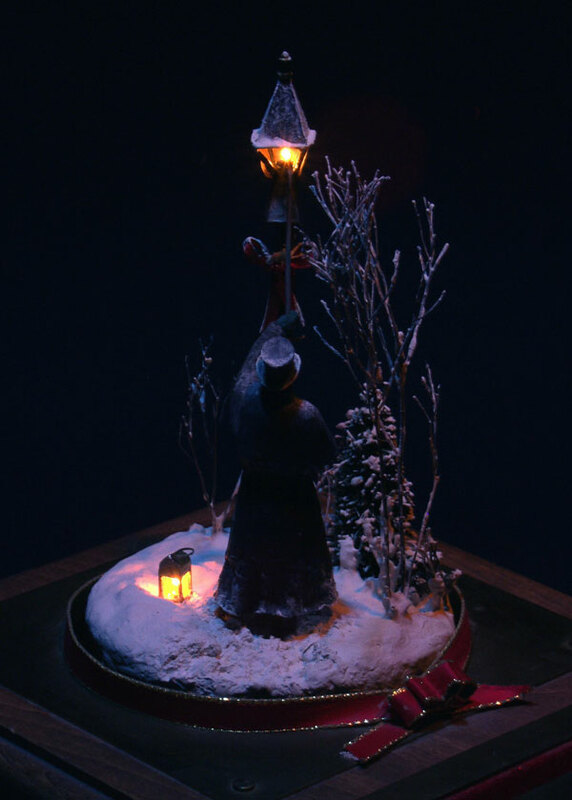 Both the lamp post and the lantern at his feet begin to light and flicker until the book is placed back into its place in the sculpture. Everything in this piece has been painstakingly been designed, engineered, built and hand carved by Artist Bradley J. Parrish including many of the inside brass mechanisms. Materials used: The Lamplighter - "Bass Wood" was hand carved and painted. The lantern, lamppost and decorative outside accents- "Brass and Plexiglass", all hand cut, tooled polished / painted and soldered. The Snow - "Spackling or Drywall Compound", also "Plaster of Paris". Designed, engineered, built and hand carved by the artist Bradley J. Parrish. Materials used: The Church - "Heavyweight Tag Board" was hand carved and painted. The Stain Glass - "Tracing Paper with colored markers. The Snow - "Spackling or Drywall Compound", also "Plaster of Paris".